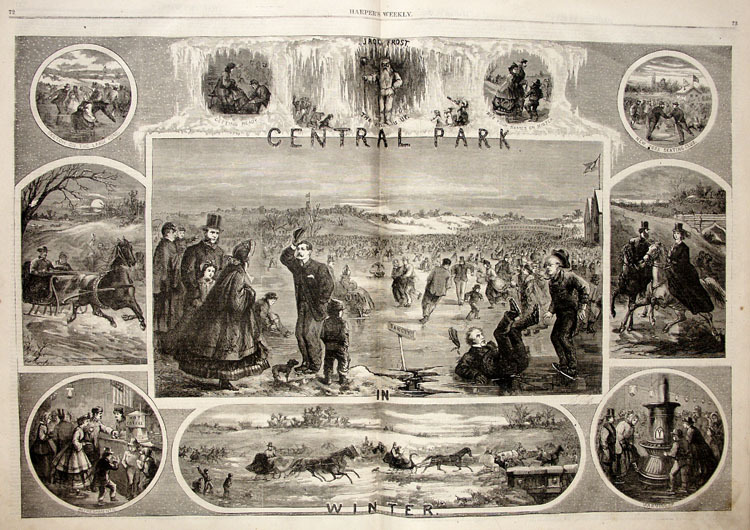 For the January 30, 1864, issue of Harper’s Weekly, Thomas Nast drew a many-paneled illustration of Central Park in winter. 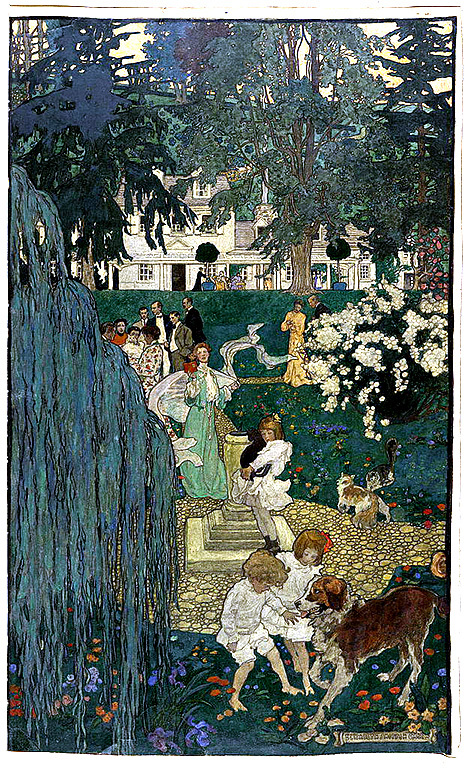 Like many of his works, this one featured a large central drawing, surrounded by smaller vignettes in round and elliptical frames. 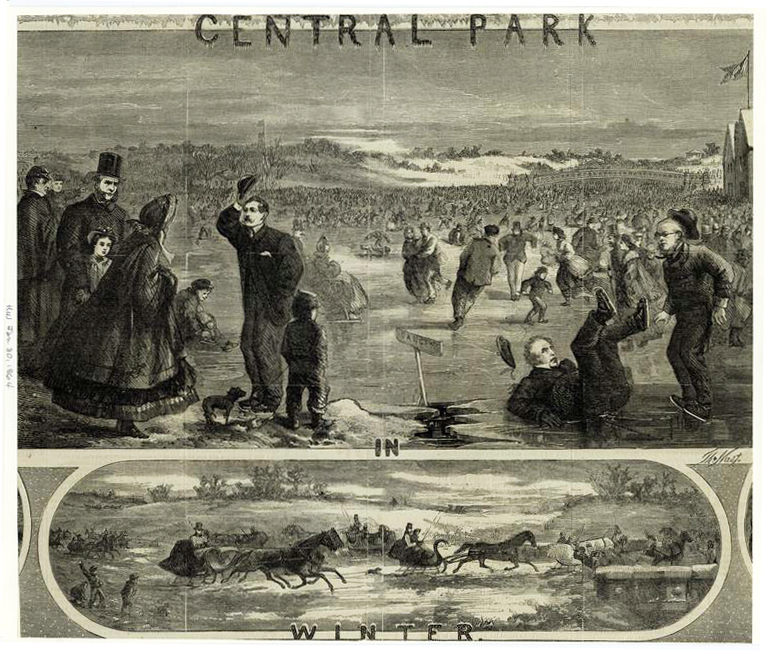 The main drawing shows New Yorkers ice-skating on Central Park’s Pond. (The Park was then only a few years old.) Below that is a rather wild sleighing scene, in which genteel New Yorkers ride through a desolate terrain, as urchins throw snowballs or rocks at them. Perhaps inevitably, Nast’s wonderland contains some politics, too. Two months earlier, President Lincoln had been reelected as an inconclusive Civil War dragged on, inflicting terrible casualties. New York, being a commercial center, had always viewed the war with ambivalence. 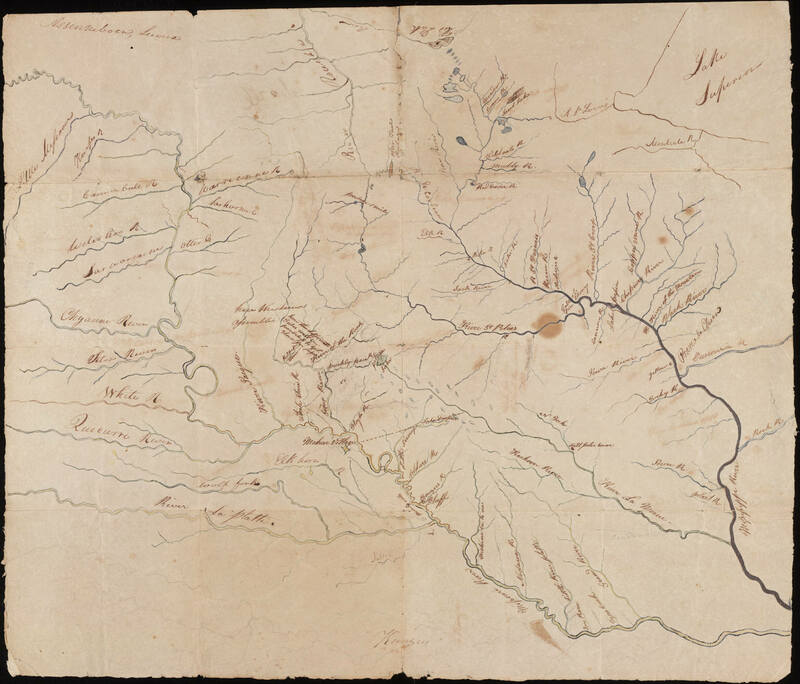 The conflict was contrary to the city’s interests, disrupting a lucrative trade with the South on which New York’s economy relied. While many New Yorkers were ardent Unionists and Republicans, the city also had a large Democratic constituency, including a politically active immigrant population, which resented the war, the federal government, and the fuss about slaves. Many, wishing a return to peace, had lately voted for Lincoln’s challenger, Democrat George McClellan. Anger over the federal government’s war policies had boiled into violence the previous July. New York became the scene of bloody draft riots, in which rioters lynched at least 11 blacks and 120 people were killed in street fighting between protesters and the police. Poor whites were inflamed against a draft bill that Congress had recently passed: while ostensibly requiring all fit men to serve in the Union military, it contained a loophole that wealthier Northerners would use to evade the draft: arranging for a replacement by paying a bounty. In the foreground of his skating scene, Nast (who ardently supported Lincoln and the war) highlights several figures, including a military man at the far left wearing a kepi—a reminder of high-minded Northerners voluntarily leading the Union effort as officers. At right are two prominent New York newspaper editors, James Gordon Bennett Sr and Horace Greeley, who have run into trouble on proverbially thin ice. Greeley is teetering, while Bennett has fallen, both near a hole signifying treachery. Bennett had been an outspoken critic of Lincoln and proponent of McClellan, whereas Greeley, while fitfully supportive of the war, had recently embarrassed the Lincoln administration by engaging in bogus ‘peace negotiations’ with some Confederate representatives who turned out to be fakes. Both editors, though overwhelmingly influential, earned Nast’s scorn because they were feckless peace-mongers. To have ended the Civil War through a settlement at that juncture would have rendered the suffering of the soldiers in vain. Their presence heightens the allegorical meaning of the left side of the tableau, where three figures guard the safety of the family and society. Besides the Union officer, who holds a small boy in his arms, Nast’s own editor Fletcher Harper (with mutton-chop whiskers) stands over a young girl protectively, while a third man (unidentified, but probably a prominent editor, too) deferentially greets a woman standing at the edge of the ice. Nast depicts these figures as both benevolent and patriotic. 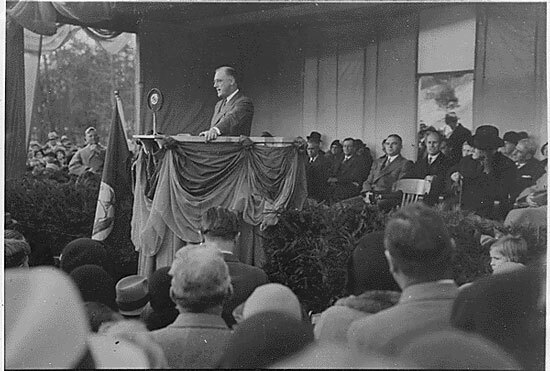 Harper gave Nast a venue for his pro-Union and radically egalitarian views. So what at first glance passes for an innocuous pleasure scene is a comment on specific editors, and a paean to the value of virtuous editors in a conflict-ridden time. Drawing by Thomas Fogarty, originally published in Collier’s on February 9, 1901. 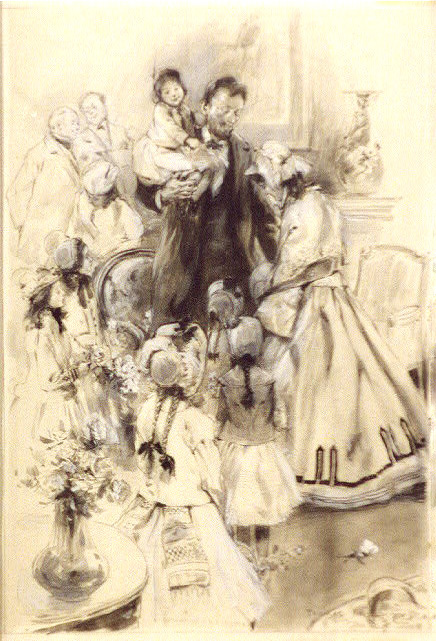 Fogarty (1873-1938) imagines a group of female well-wishers paying Lincoln their respects on his birthday. Girls and a fashionable lady cluster affectionately about the president, who holds a beaming child on his arm. February is seldom as fun as I hope it will be. I dream of escaping to the sledding hill or spending an afternoon out ice-skating, but instead I end up trapped at my desk, thinking of dead presidents, the white and black races, and slavery. How fortunate we are that Lincoln’s presidency came just after the development of photography! Of course, by the time he first took office in 1861, certain photographic processes, notably daguerreotypes, had been around for decades. But only around mid-century did photography develop into a versatile, practical, and widely circulating medium. As a consequence, whereas photographs of Lincoln’s predecessors in the White House are scarce, Lincoln and his political contemporaries had their pictures taken many, many times. Some even became shrewd retailers of their mechanically reproduced selves. 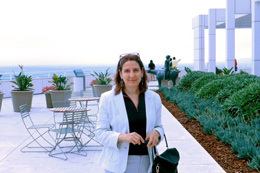 The result, from the point of view of the present, is an opening-wide of the window onto history. 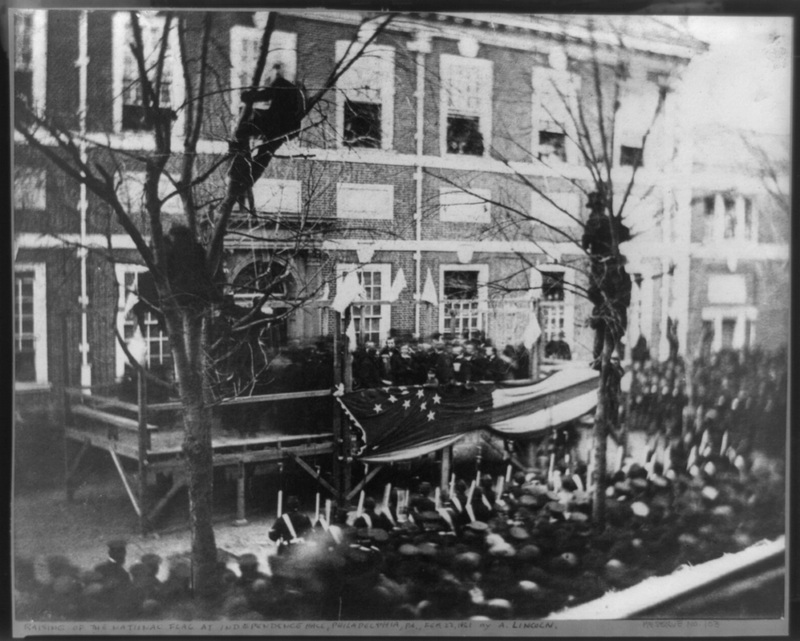 Whereas details of James Buchanan‘s 1857 inauguration come down to us mainly through artistic and verbal description (there is this one blurry photograph), good photographs documenting both of Lincoln’s inaugurals survive. 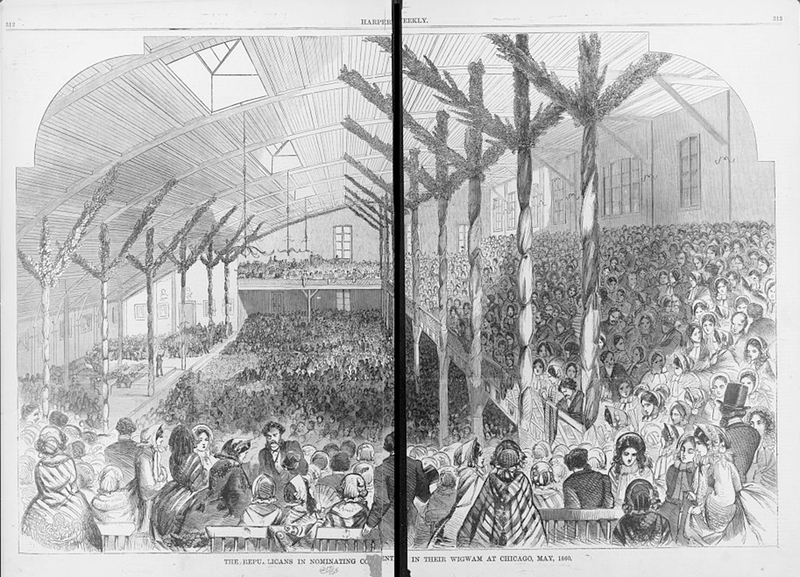 From 1861, for instance, there are several fine distant views of Lincoln taking the oath of office, though none of them is close enough for us to make out his great defeated rival, Senator Stephen A Douglas, who, according to historical testimony, is said to have been looking on from a seat nearby. These photographs remind us of the immature, precarious state of the Union at the time. The great addition of the new Capitol dome was incomplete, and, even as Lincoln moved to forward to assume his elected office, the elements that made up the nation were breaking apart. Prior to March 4, 1861, when this picture was taken, seven pro-slavery states had seceded, and afterward, four more southern states would depart. 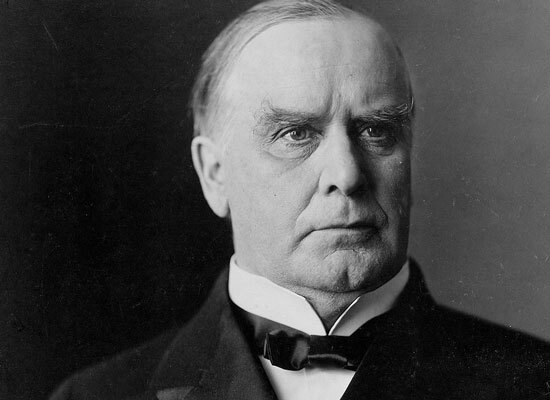 On April 12th, with the firing on Fort Sumter, the nation would descend into a state of war. The crowd gathered for the swearing-in knew that they were witnessing a momentous scene. The crowd was thick; most had furled their umbrellas; men, straining for the best possible view, mounted light poles and trees. Motionless, they strained to hear the unamplified proceedings, the camera preserving the style of their hats and clothing. Two men turn to face the camera, cannily. The succeeding years saw a widening use of open-air photography, so that we know with some immediacy the Civil War’s corpse-strewn scenes. Photographers like Alexander Gardner (by then working for Mathew Brady) tirelessly trailed the armies, unflinchingly recording the realities of camps, hospitals, and battle-fields. By the time of Lincoln’s second inaugural, in 1865, the war was in its final months, slaves had been liberated, and the nation had become accustomed to seeing itself through the lens of photography. This wonderful photograph by Gardner captures the look of that later crowd. Here, the people themselves, not the government nor the army, nor their most powerful representatives, are recognized as camera-worthy, as they gather on an inauguration day that is once again wet and muddy. Great coats and banners billow in the breeze, as knots of spectators stand about, chatting or strolling as they please. In time, they part to make way for the inaugural parade, in which Union regiments of both races proudly march. Is it my imagination, or is there a touch of jubilation here, missing from the earlier proceedings? Though the war had yet to end, the prospects for the Confederacy were dwindling sharply, and Americans who had fought to keep the nation together knew that their victory was sure. Bare-headed, Lincoln reads his message of reconciliation to a crowd radiating around him like magnetic filings, the dais overflowing with dignitaries. A miscellaneous crowd of watchers stands beneath him, studying the crowd while listening. It is a homely scene with little pageantry, suited to a federal republic that, though riddled with conflict, has endured trials to grow in confidence and power. Outside the frame, the Capitol dome has been completed, and stands triumphantly capped with the Statue of Freedom. 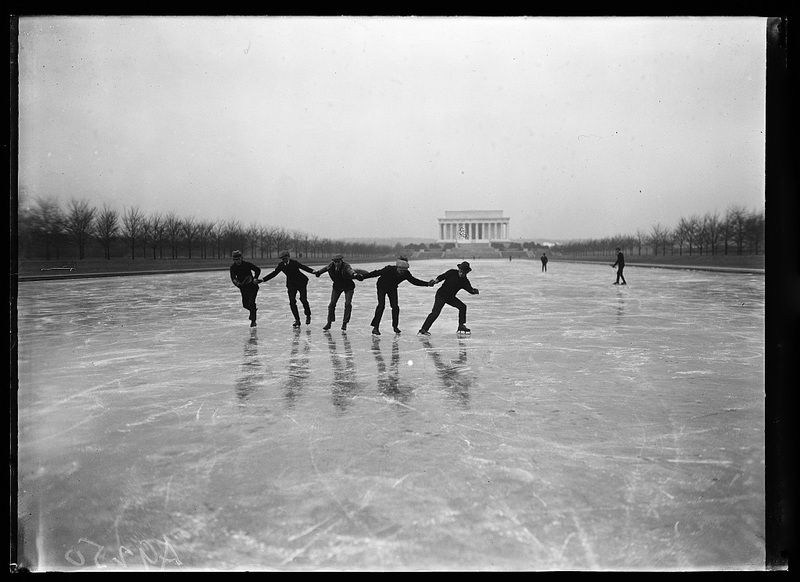 All images from the collections of the Library of Congress. 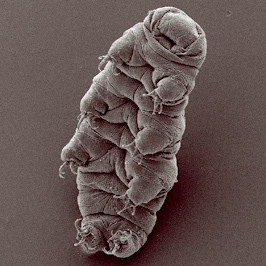 Click on the images for more information and larger views. For those whose consciousness is tuned to the Civil War, April is strewn with anniversaries. The war began April 12th, 1861, with the Confederate barrage of Fort Sumter. Four years later, it ended on April 9th, with the rebels’ surrender at Appomattox. 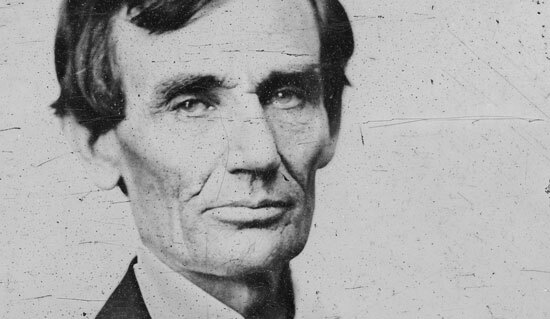 A week later, President Lincoln was slain while sitting in a box at Ford’s Theater. That spring the injured nation lay under a blanket of a peace, a peace fraught with exhaustion, anger, uncertainty. It’s hard to fathom what Americans at that time felt, experienced. On the far side of a dreadful, violent division, they had run a course that intransigence — impatience — and distrust — dictated. To say Progress Is Unpopular is putting it mildly. Those who could not put up with change, those unhappy with the course of progress, those who were sick of compromise and unwilling to think even for one minute of living without slavery — these were the people who threw in the towel. They walked away from Congress, from compromise and debate. 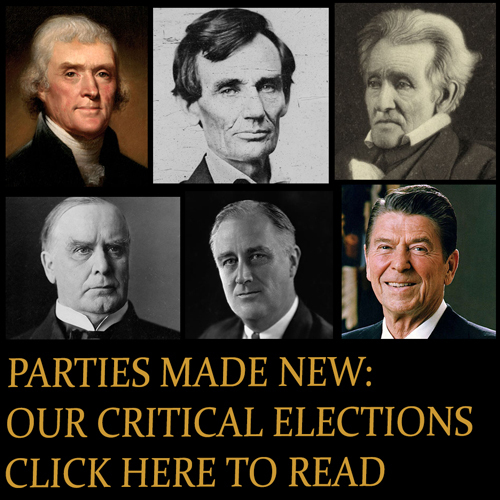 Rather than accept a turn of events they conceived of as a humiliating political defeat, they rebelled against the federal government and sought to go their own way. 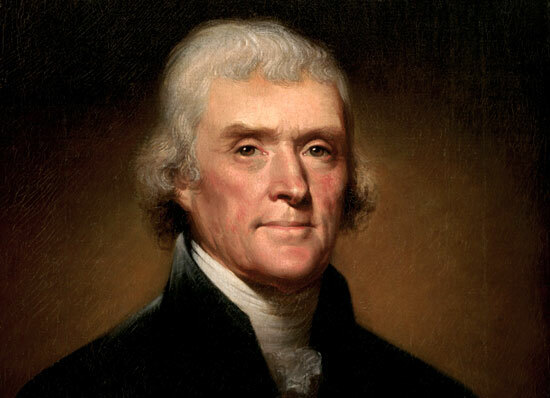 The ensuing war was coercive, decisively establishing the ultimate authority of the Union and the federal government relative to other interests and claims. Among my belongings is a small drawing, a bit of memorabilia from that unhappy time. It’s a tiny sketch on Union stationery, showing a view of Fort Monroe from the water. The artist was a young man, Charles T. Dix, whose father, John, was in charge of Union forces there at the time. Located in Virginia at the tip of the peninsula formed by the confluence of the James and York Rivers, Fort Monroe became a haven for former slaves who gained their freedom by leaving rebel territory. After the war, the fort was where former leaders of the Confederacy were imprisoned. 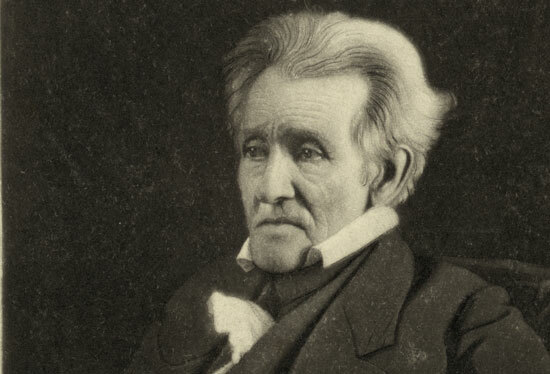 Jefferson Davis was held there for what many considered to be an unconscionably long period. Hitting on the appropriate way to treat men who had presided over such a protracted and devastating rebellion took a long time. It has taken far longer to discover how to realize the dream of freedom and equality that was an inseparable part of that dark struggle. 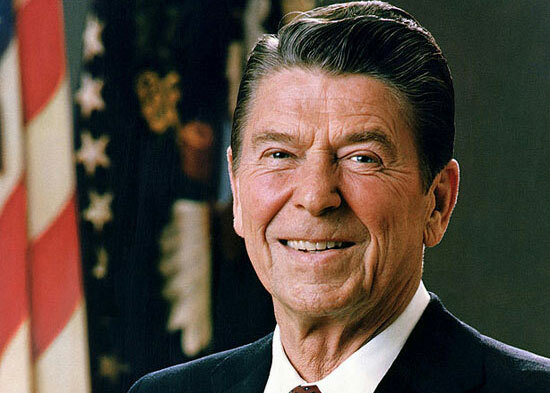 Ultimately, though, we have struggled toward it, however benightedly, struggled toward it with and without great statesmen, struggled toward it in a world without Lincoln.